To their credit, Avalara’s email header takes up very little vertical space, so more valuable selling copy doesn’t get pushed down the page. An image of the offer appears in the sidebar, making that offer more “real” and tangible. Unfortunately, the main body copy lets down the side completely. 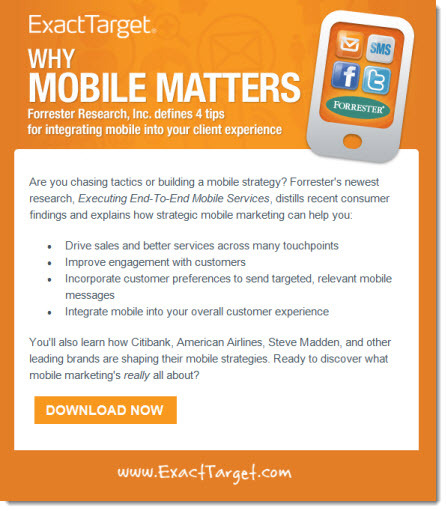 In stark contrast, the email from ExactTarget wastes no time in communicating exactly what the offer is, and why the reader will find it valuable. Note the sub-head (“Forrester Research, Inc. defines 4 tips …”) that instantly delivers tangible value in specific, quantifiable terms. The bulleted points are all clear, compelling learning benefits – what the reader will gain by downloading the report – and the fact they’re bullets makes them easy to scan at a glance, whereas Avalara’s email is just a mass of text. Use of the second person (“You’ll also learn how …”) drives home the point, and a clear call to action (“Download Now”) closes the deal. If I were being picky, I’d change only a couple of things about the ExactTarget campaign. First, the header is too large by half. I’d lose the ExactTarget logo and reduce the mobile phone icon (or replace it with something that better represents the offer.) I’d also make the headline HTML – in its current form it disappears entirely unless I’ve set Outlook to download images automatically. And lastly, I’d add a text link (“Download your copy now”) in the very last paragraph for the same reason – with images turned off, there is no visible call to action for the reader to click. 1. Keep email headers short to avoid pushing valuable selling copy down the page. 2. Feature an image of the offer to make it more tangible. 3. Communicate learning benefits, not facts. 4. Use bullets in body copy to make key selling points stand out at a glance. 5. Use both text and button-style calls to action. This entry was posted in B2B Marketing, Content marketing, Copywriting, Creative, E-mail, email design, email marketing, Graphic Design and tagged Avalara, b2b demand generation, b2b lead generation, Content marketing, Demand Generation, email copywriting, email creative, email design, email marketing, email marketing best practices, email marketing tips, ExactTarget on April 23, 2013 by Howard Sewell. I understand that you’re focusing on the format of the email and copy in this comparison for the most part, but I’d like to present a point that struck me as I was reading your post. I’m not sure this is a fair comparison if you think about the recipient. 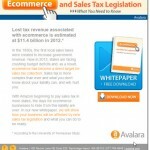 The person receiving the Avalara email is likely in an accounting role. These people like facts and figures and they want to learn about tax legislation from an authority. Therefore, I’m not so sure that the email was ineffective, even if it could have been formatted better. 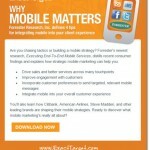 The ExactTarget email was written for a marketing crowd. Totally different audience to engage. Thanks for the comment! I agree with you to a point. Yes, financial types are naturally drawn to facts and numbers. But that doesn’t mean that you can’t use those facts and figures to sell the offer. Virtually nothing in Avalara’s email is action-oriented; it’s just a lecture. You could tell me all the wonderful things I’ll learn by downloading the white paper, and do so in very financial terms, and have a much more effective email for it, in my view. My partner and I had almost the same conversation as you two. Tracey agrees with Ardath, I agree with Howard. We were talking about white papers, and Tracey said techies wouldn’t mind dry, factual (almost impenetrable to us) white papers whereas business types would like their white papers to be more succinct, more pointed and more entertaining. My view is this: No matter who the audience these days, I suspect readers will respond better to a format that presents key points in a clear, succinct way, and writing that is engaging.